SAM: The Digital Age, you’re four members out of six that were the David Crowder Band. Why did you guys choose to stick together to become this band? MARK: So the David Crowder Band was the worship team at our church in Waco, Texas, which is a small college university town that all of us went to school there – Bailey University. We all ended up playing at this church. And the worship team eventually became the David Crowder Band and a few years ago David left to be around the Passion City Church gang – Louie Giglio, Chris Tomlin, all those cool cats. The rest of felt like it wasn’t time for us to really change, so we’re kind of a continuation of what the David Crowder Band was doing. We’re still writing worship music for the same congregation and we’re still located at the same community, and so it’s more of a continuation of what we were doing – and we really didn’t want to mess that up. We still wanted to stay where we were and do what we were missionally trying to do with the David Crowder Band which was trying to write a little more alternative worship music for that kind of demographic and for our church. It’s been really fun to actually start up something new but to keep a lot of the same things. SAM: Yeah, and the music stylings on this album as I listen to it, there’s a lot of electronic influences and glitchy sounds. Was that clear that you as a band wanted to go down that path? MARK: No, I don’t think we as a group really have a path that we think we’re going down. I think for us we’ve kind of used genre as a tool. So, for us the sounds are what whatever we’re listening to at the moment. It’s a song by song basis actually. A lot of people joke that the album sounds a little scatterbrained which is kind of a compliment cos for us, we just try to write songs that sound like what we would want to listen to, and what our congregation would want to listen to. So sometimes it’s electronic, sometimes it’s folk, sometimes it’s pop punk. It’s fun for us to use genre as a means to an end and not the actual sound of the band, but the electronic stuff is something we always did with David Crowder Band and it’s something that’s ingrained in us. We’re a very computer savvy band, we just sit on airplanes making beats and stuff – so it’s fun to keep that element alive. SAM: The album is twelve tracks, and I read that it takes us from 7pm to 7am – is that correct? MARK: It does! We had this idea for a concept record of going from the evening to the morning and the last David Crowder Band record was a requiem mass called Give Us Rest which is an album based on a mass for the dead. Which is kind of dark! But we wanted our first record as The Digital Age to be a record about life. So it’s a conceptual record that goes from this darkness from evening to morning, and from death to life, and from uncertainty to certainty. So it’s this cool idea that we had that really was fun to flesh out. And every song corresponds to an hour of the night. The first track Captured goes, theoretically, from 7pm to 8pm, and then the next track goes from 8pm to 9pm. Obviously they’re not hour-long songs, but they correspond to an hour. So lyrically and thematically they kind of follow this journey from going from a place going ‘Oh God, I don’t know what’s going on but I know you’re in control and I know when I reach out, you’re there’ to knowing at the end of the day you’ve seen the light and you know where you’re going and you know God’s in control. So it was really fun for us as songwriters to write that, but as a band it was really cool because it was mirroring our story of going from this time of uncertainty and not sure what exactly we were doing but knowing God was there and knowing ‘hey, we need to do something’ to, knowing God has illuminated this path for us and shown us. So it’s a really special record, especially being a first record for us as The Digital Age. It has a lot of kinda heavy meaning for us, but again, it’s not beat over your head with the message, it’s supposed to be an easy listen. If you listen, there’s all these subtle wordings and clues that kind of tell you where throughout the night we are. SAM: It’d be interesting if you were to perform as The Digital Age through the night – to play this album as it’s meant to be heard – but you’d have a lot of gaps! MARK: We’ve thought about doing that. I still think we might do that at some point. We have a recording studio here in our hometown that we can totally do that. We can set up some webcams or something and do something fun but I wouldn’t count that out. SAM: The first song on the record, Captured, it’s incredibly joyous. Is it written out of a part of Scripture in particular? MARK: Yeah, a lot of it was out of Romans 8, it’s more of a chapter than a verse. There’s a lot of lines in there that we took inspiration from, and this idea if when we reach out… and it really kicks off the record thematically and that’s why we made it the first track, but it’s also funny because lyrically it’s not a joyous song. It’s like ‘when I reach out you’re always there, you’ve captured me’, but the idea is that in the darkness you can reach out and know God is there… It’s this idea of knowing we’re going through whatever – happy times or good times, but when we reach out we know God is there. My favourite line of that song is in the bridge. It says: ‘I’ve never felt more found than when I’m lost in you.’ As a band, that was like our favourite lyric of the record because it really says what we were trying to say. It’s like – you know what? We’re never more found than when we’re completely lost in you and even if we don’t know our plans or if we don’t know what we’re supposed to be doing, we know that we have identity in Christ and – we can do all things through Christ. In those moments where we feel like we don’t really know what we’re supposed to be doing, that we know if we reach out, if we look for God – there’s gonna be signs, he’s going to be speaking to us, there’s going to be him walking us through those periods of life that are a little scary, but also can be very exciting. So for us as a band it’s just a really happy song about… sometimes when you don’t feel God, that’s OK, because God’s there if you reach out and are looking for him. SAM: The video clip for Captured – it’s incredible. It features all these fan-submitted videos. And I saw that you promised to use every one in there. How long did it take to go through them all and edit it together? MARK: Oh man, that was a mistake. [Laughs] We had this idea of this music video and we had this whole treatment all in our heads, and we knew what we were gonna do. We were gonna have people submit videos and we had this really funny concept. And then I put out a video that says ‘if anybody sends a video, we will use it’. And so we actually ended up getting way more video submissions than we thought, which was actually a huge problem because we had to completely re-do what we were going to do with the video. So the video we were gonna make never got made. Yeah, it actually took our drummer Bwack… He’s like an evil genius – or not evil, he’s not an evil genius – he’s a nice genius – but he builds robots and stuff and he’s just got a crazy mind. And he started digging through the footage and just said ‘Oh ok. I think I’ve got an idea.’ And so as soon as he told us his idea we started just working on it. It took about a month of going through all the stuff and figuring out how to get it all, because I don’t know how much you know about video, but when you put a screen and you put every video on it, the resolution is crazy. So by the end, once he had all the videos in, every time he made a change… Bwack would show us the new edit and we’d be like ‘Oh that’s cool, if you could move that one here, and move that one here,’ he would make the change and it would take his computer – which is a pretty new fast computer – it would take it all night to render and get it ready to play back again. So it took him a while! But I think it’s amazing, it’s so fun for us to watch now and see how happy people are with this song. It’s really fun as a band to see people jump around and interact and play all these crazy instruments. SAM: Is there a big idea or key message to this album? MARK: Yeah, I mean, for us the idea is that through uncertainty and through darkness God is there, and God has plans. Whether you see them or not. So for us, that whole theme of going from the evening to morning, and going from this place of darkness and uncertainty to light and certainty really was what we were going for. And as a band it’s kinda cool because when you song write, a lot of times you can lock yourself in a room and write a song. But for us what we tried to do is come up with the theme of the record with the idea of the record first. So we had that and we were able to go ‘OK – this is what we want the record to be about, so now let’s write songs into this frame, and into this context.’ So by doing that it has a pretty cookie sivv message which is fun for us but it’s also fun for the listener because it’s pretty blatant. SAM: Do you reckon there might ever be a follow-up album from morning to evening? MARK: [Laughs] Hmmm! You are the first person to ever ask that question! I don’t know – that’s a very cool idea! I don’t know, maybe. That’s the answer – it’s maybe! I don’t know. I should kick that around with the guys. That’s very interesting. SAM: Well I’ll let you have that idea – I won’t charge for that idea – it’s all yours. MARK: OK thank you, that’s very gracious of you! SAM: I’ve been following you on Twitter, and I’ve noticed over the last few days you’ve been very nostalgic about the ’90s. You posted a tweet this morning saying that you’re giving away two free [pick-up] tickets to your Colorado Springs show under the name Darkwing Duck. Do you like Darkwing Duck? MARK: Oh I used to love Darkwing Duck. I haven’t watched it in a while, I just got a little nostalgic, talking about the 90s. [Laughs] I left some tickets for Darkwing Duck – I think he showed up, I don’t know. I forgot to check! SAM: He came out of 90s World in his purple cape. SAM: And then you also posted the other day that you miss 90s one-hit wonder bands. Were you thinking of any in particular? MARK: Yeah, y’know there was a couple… There’s this band called The Real McCoy and they had a song called ah… Oh I can’t even think of it. But somebody just randomly started singing it. I was like ‘Oh my gosh! That’s a great song!’ And then I started singing Ace of Base, The Sign which – they actually had a couple of hits, so they’re not a one-hit wonder but there’s a very small window when Ace of Base was around. But, yeah there’s just a couple of 90s songs that really were the best songs ever. SAM: I thought of the Bomfunk MCs with Freestyler. MARK: Oh yeah. I remember that. SAM: On a more serious note though, how important is it to you that the gospel is communicated through your music? MARK: I think it’s probably the most important thing. You know, what we do is there’s nothing hiding behind it. We are a worship band, that’s what we do. We write worship music for the church. We’re based out of a church. Our mission is to write songs that articulate the faith, for people in the church. Our goal is just to write songs that can be useful to people, not only in our church but in other churches around the world. I think that’s very, very important – that is what we do and that’s why we do what we do. Our favourite thing in the world is getting people to sing to God and if we can be part of that or facilitate in any way then I think we’ve succeeded as a band. That’s pretty much everything. SAM: The track Believe is one of my favourites and it really does spell out the gospel, and unashamedly so. What should we listen for as we hear it? MARK: Yeah, that song actually came out of a conversation I had with a pastor at our church. Really, it’s just the apostles’ creed. We were talking about – why do we try as modern worship writers to keep trying modernising words when you have these beautiful words sitting right in front of you? So we got back to the studio and as a band we just sat around and started singing the apostles’ creed and then we pulled up the Nicene creed but – just singing these words over and over again that have had so much historical meaning and weight. It’s a pretty powerful song for me, because you’re singing these words that we didn’t write – I mean it’s our song that we wrote – but the words have just been around for so long and it’s most basic Christian dogma. It’s what we believe as Christians in the most pure, simple form. So it’s really powerful when you get a congregation together and they actually sing these words. There’s a lot of power there. SAM: Mark, is there any chance you might tour this album to Australia? MARK: Oh yeah. I hope so. We kicked that around to our manager a couple of weeks ago. I said ‘We need to get over and have some good Australia hang time.’ So, I really hope so. We’ll see what happens. But our 2014 is completely wide open at this point. So I’m gonna try and nudge some people, make that happen. SAM: So what do you have planned for the near future, other than touring? Any other things locked in? MARK: We’re gonna be touring like crazy next year. We’re gonna be pretty much non-stop. But we’ll see what happens with that, it should be real busy. SAM: …The last track on the record Morning Sun, it closes the album. It contains bird noises. Why finish with this song? MARK: Ah we just had this vision of the album Evening:Morning ending with this beautiful moment where you wake up and you go outside with your coffee and you just sit and you go ‘Wow! Look at this beauty. Look at this creation.’ The birds are chirping, the sun is out. And you can feel in that moment, when you go through the times of doubt and kind of questioning. And then you have that moment of clarity when you’re sitting outside and it’s just beauty. And you see that from those ashes, God made beauty. And the concept of this beauty – beauty to ashes [sic] is really what we wanted in this moment where it just feels like you’re outside breathing in the fresh air, listening to the birds chirping. And it’s just a really peaceful, calming song. It’s a really cool way to end the record for us. It’s a really special song for us. SAM: Mark, I’ve loved getting my ears around this record. I think it’s fantastic. And thanks so much for talking with me today. MARK: Absolutely. Thanks for having us and hopefully we’ll be in your space soon. I’ll start working on us coming over to your beautiful country. 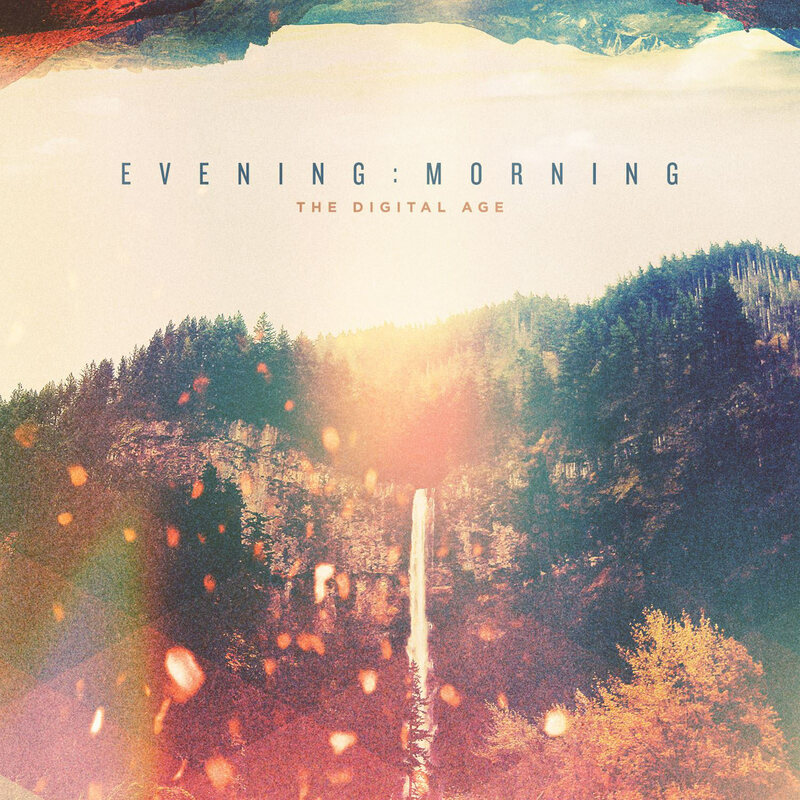 Evening:Morning by The Digital Age is available now on iTunes. Posted in MusicTagged Album, Captured, christian, Darkwing Duck, David Crowder, David Crowder Band, Evening Morning, Evening:Morning, God, Mark Waldrop, Music, The Digital AgeBookmark the permalink.